UNRWA heet een humanitaire organisatie te zijn die de Palestijnse vluchtelingen helpt, maar is in de praktijk vaak een verlengstuk van de Palestijnse strijd tegen Israel. UNRWA baas Chris Gunness laat zich geregeld fel anti-Israelisch uit, lijkt alle Hamas propaganda voor zoete koek te slikken, en op UNRWA scholen leren kinderen om niet alleen Israel maar ook Joden te haten. Dergelijke zaken worden door media en politiek zelden, of eigenlijk nooit, als obstakel voor vrede erkend, en uitspraken van UNRWA medewerkers worden hoog aangeslagen. UNRWA speelt een grote rol in de ideologische strijd, omdat zij Palestijnse posities een air van legitimiteit en objectiviteit geeft. Given that there is no way the UNRWA education system is going to fix itself, and its role in churning out generations of children who are being taught to hate, It is way past time to dismantle this sick institution whose only remaining purpose is to keep the cash flow coming. 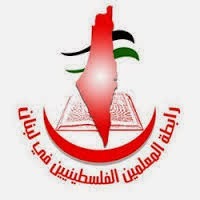 The Palestinian Teachers Association in Lebanon is intended to provide support, guidance and news for its members. Its goals include defending the rights of teachers, improving their economic and social conditions, sharing knowledge and skills, to work on the development and activation of the teachers union in UNRWA and to help the development of UNRWA schools. I believe that every Palestinian teacher in Lebanon works for a UNRWA school, since Lebanese anti-Palestinian apartheid laws do not allow Palestinians to live outside their UNRWA-run camps nor do they allow Palestinian teachers get jobs in regular Lebanese schools. The association website, written by and edited by these UNRWA teachers, includes many examples of explicit antisemitism and even Holocaust denial. The logo itself shows how interested the association is in co-existence with Israel. Haitham Kawash, teacher at the UNRWA Salamah school in Sidon, encourages violent Jihad against "cowardly Jews" to free all of Palestine. This article discusses whether Jews have the right to live in Israel, and concludes "For what purpose do the children of Israel want the blessed land now, where they no longer have any role except (spreading) corruption on earth?" Another article traces the history of racist Judaism, saying among many other things that "Jewish racism preceded the racism in Europe by several centuries because its roots go back to the Torah and the Talmud." Here's one that falsely claims that the Talmud calls non-Jews pigs and wild dogs and instructs Jews to kill disbelievers. A recent article denouncing the visit to Auschwitz by a Palestinian teacher and his students says "I do not consider the Holocaust a massacre against the Jews only, victims of the Holocaust were Jews, homosexuals and the mentally ill physically disabled and others, but [the teacher] did not mention that traitors and spies were among those targeted by Hitler, and we emphasize that fact, and also emphasize that the number of all of those [killed] did not exceed one million, and the targeting of Jews did not have a religious background, but also for sexual deviations and mental illness and the charge of treason, so why do a pilgrimage to the graves of traitors and perverts? " There are many more such articles being promoted and written by Lebanese Palestinian teachers in UNRWA schools. I could not find a single article that was sympathetic to Jews. We see that the problem of bigoted, antisemitic teachers employed by UNRWA is not limited to Gaza, but is throughout the entire UNRWA system. Is there any doubt that Syrian and Jordanian UNRWA schoolteachers are just as bad as those in the territories and Lebanon? In our school, we teach the children from their first year about their country and how it was stolen from them. I tell my son of seven. You will see: one day a man of eighty and a child so high, all, all will go home with arms in their hands and take back their country by force. There is a direct line from UNRWA teacher radicalism and terror attacks happening today. We've provenjust this week that UNRWA is not interested in reforming or admitting mistakes in its huge education system - instead it does everything it can to cover them up. But they can't hide the hate. It is in plain sight for those willing to do the research. UNRWA's latest commissioner general Pierre Krähenbühl has been given many opportunities to address and fix the issues of UNRWA teacher hate and antisemitism I revealed over the past two weeks. He chooses not to, and instead simply ensures that embarrassing websites that prove UNRWA's teaching of hate and tacitly encouraging terror are simply deleted, hoping that the mainstream media will not pick up on this story. So far, his gamble is paying off...but it won't forever. He cannot delete the websites that are not under UNRWA control. He cannot delete the Facebook and Twitter accounts of UNRWA teachers that reveal their Jew-hatred every day. He cannot hide the truth. The fact that he has tried to do exactly that is all the proof you need that UNRWA is an inherently corrupt institution. Its donors may be interested in knowing this. Wat is nu de rol van Qatar? IS begeeft zich naar Gaza?